The surface of Uranus' moon Miranda (seen here) is pocked with craters, but humans might be able to find a way to settle it. The image was taken during Voyager 2's flyby of the Uranus system in 1986. Uranus would be a fascinating planet to visit, but living there would be extremely difficult. However, its moons are a different story. In all, Uranus has 27 known moons, and its five largest satellites are often considered its "major moons." If we wanted to set up permanent bases on Uranus's satellites, Titania and Miranda are great targets — Titania presents the strongest gravity (almost 4 percent of Earth's), and Miranda has a surface ripe for exploration. Because Voyager 2 is the only spacecraft to visit the Uranus system, Earthlings still don't know much about the planet's moons. Titania, an airless moon of Uranus, is cold and its day is 84 years long. See what it would be like for an astronaut on Titania in this full infographic. Images from Voyager 2 show that Titania's southern hemisphere has numerous craters and tectonic landforms, including canyons and faults, some of which could be interesting locations to visit. The largest crater on Titania is about 203 miles (326 kilometers) across, and its longest canyon extends over 930 miles (1,500 km) from its equator almost to its south pole. The surface of Miranda, on the other hand, is incredibly varied and jumbled, resembling a jigsaw puzzle that wasn't pieced together correctly. It sports odd formations called coronae, which are oval grooved structures resembling racetracks. It also has cratered plains that are crisscrossed with huge canyons and faults. Some of Miranda's fault cliffs are about 12 times as deep as the Grand Canyon. Because of Miranda's very low gravity (less than 1 percent of Earth's), a rock dropped from the top of the cliff would take about 10 minutes to reach the bottom. These faults could provide fun for thrill-seekers. "I think it would be a little dangerous, but if we lived on Miranda there would probably be a few daredevils wanting to jump off the cliffs," Moore told Space.com. All of Uranus' moons lack weather, sky colors and surface pressure due to non-existent atmospheres. They are also very cold: the average temperature of Titania, for example, is about minus 334 Fahrenheit (minus 203 Celsius). This image of Titania, taken by the Voyager 2 probe, shows the cratered surface of Uranus' moon. Aside from the deadly cold, it's not clear what kinds of dangers you'd experience on the moons. They may have moonquakes, as well as cryovolcanism that could shake the ground. Intense radiation from charged particles produced by Uranus's magnetosphere could also pose a problem, especially if you lived on the side of the moons facing away from the planet (one side of Titania and Miranda face Uranus at all times). Titania takes almost nine Earth days to rotate on its axis, while Miranda takes about 1.4 days. If you lived at the equator of these moons, you could experience a "normal" day-night cycle, but the same isn't true for the poles. Unlike other planets in the solar system, Uranus has an axial tilt of about 98 degrees. This means that during the planet's 84-Earth-year-long trip around the sun, the poles of Uranus and its moons experience 42 years of sunlight followed by 42 years of darkness. If you looked at the sun through a filter from Titania or Miranda, it would appear as a very small disk and not just a point of light, Moore said. And if you were on the side of the moons facing Uranus, the planet would be huge — Uranus would be about 41 times the size of our moon from Miranda, and about half that size from Titania. 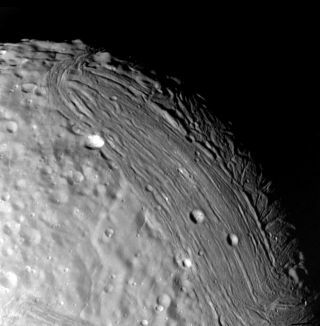 You could also see the other major moons of Uranus from the surface of Titania and Miranda. "All would form an appreciable disk in the sky," Moore said. And if you wanted to email a photo of Uranus or its moons to your friends and family back home, that radio signal would take, on average, about 2.5 hours to reach Earth. Editor's Note: This part of Space.com's 12-part series "Living on Other Planets: What It Would Be Like" to see what an astronaut would see on other planets and moons of our solar system and beyond. Check back each Tuesday to see what humans might encounter on other cosmic bodies in the universe.